The grab-bag of goodies we've given Eva Moskowitz is very disturbing. Most disappointing to me is Cuomo has more or less neutered the great progressive hope of these United States, Bill de Blasio. De Blaiso was elected on a platform of stopping colocations, and it appears much of his authority has been usurped by the state. The will of the voters is paramount in a democracy, but the will of Eva Moskowitz and her rich BFFs to contribute to Andrew Cuomo and multi-million dollar ad campaigns has trumped that. I've seen zero evidence of any fightback from the UFT, and maybe Cuomo's sudden willingness to look at not judging teachers by results he's deemed unfit for kids is a payback. If so, it's far from sufficient. They're still discussing implementation, but there will always be issues when you implement something that is garbage. Putting it off for two years is no panacea for kids or teachers. There's a long and consistent record of miserable education legislation in NY State. The APPR is flawed in that any percentage of junk science VAM is too much. While UFT leadership may have initiated one of the worst programs by allowing Reformy John King to decree ours, there are other flawed programs around the state. Nonetheless, I've spoken to union presidents who've negotiated much better systems than ours, and I think NYC teachers would be much happier with simpler, less insane programs. Clearly, whatever is negotiated, the optimal percentage of junk science in any system is precisely zero. The folks at Revive NYSUT are fond of calling the junk science law the Iannuzzi APPR. Oddly, they neglect to mention one of their most significant supporters, Michael Mulgrew, was right there with Iannuzzi when it was negotiated. UFT members will recall that it was presented as the best thing since sliced bread. The most wonderful thing about it, of course, was that there was so much to negotiate. A UFT rep told my school it was great, because it was necessary to negotiate a contract to enable it. Not only did that not happen, but we also allowed John King to dictate the entire program. How UFT leadership determined King to be an unbiased arbiter boggles my mind. Let's take a look at the rest of the NY legislative record, presided over by Unity-UFT's Andy Pallotta and largely ignored by Revive. The property tax cap law, championed by Governor Andrew Cuomo means that suburban districts are scrambling for ways to pay teachers and fund schools. Governor Cuomo, in his infinite wisdom, decided that it would take a 60% majority in order to approve a hike over 2% or rate of inflation, whichever is higher. My sources tell me this year's cap is 1.46%. 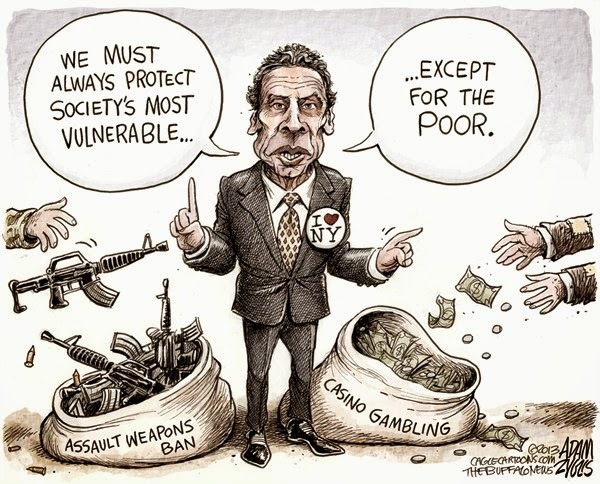 It's beyond my comprehension that Cuomo musters the audacity to call himself a student lobbyist when he's championed a system in which people who say NO to our kids get more of a voice than those who say YES. Couple this with a Gap Elimination Adjustment that cuts state aid, and you've got obstacles local districts simply cannot surmount. While the Moskowitz Budget gives some aid back, we're still not caught up. Meanwhile, Andy's kept $8 billion in the state coffers that could've gone to aid our children. College costs are rising and aid to state and colleges is declining. We are moving backwards in all too many ways. We should be encouraging and supporting our children in their efforts for higher education, but instead Governor Cuomo is worried that people who inherit millions are paying too much taxes. Personally, I care a lot more about some kid who can't scrape up $8,000 to go to a state school. I'd much rather see the millionaire pay a few extra bucks than watch one of my students stuck in some dead-end minimum wage job. And let's not forget Tier 6, where members pay more to get less. That's hardly how we support working people. This needs to be fixed. We are union, and we need to take a stand. This is a pivotal moment. Parents are outraged about the Common Core abuse of their children, and rightfully so. It's a time to clue them in that VAM is part and parcel of the same cabal. It's time to unite with them because they are our natural allies. We share a common interest--we want what's best for their kids, whether or not it pleases Bill Gates, Eva Moskowitz, or the Walmart family. NYSUT is 600,000 strong. Last June, in a rally the UFT didn't really bother with, NYSUT brought 20,000 people to Albany. That's a strong statement. Imagine the statement that will be made when public school teachers stand with public school parents. This can happen. It has to happen. We can make it happen.